Swinton, George. "John Tiktak". The Canadian Encyclopedia, 25 May 2018, Historica Canada. https://www.thecanadianencyclopedia.ca/en/article/john-tiktak. Accessed 22 April 2019. John Tiktak, sculptor (b at Kareak, a small camp between Eskimo Point (now Arviat) and Whale Cove, NWT 1916; d at Rankin Inlet, NWT 9 June 1981). At first a hunter, he moved to Rankin Inlet in 1958 to work at the nickel mine. 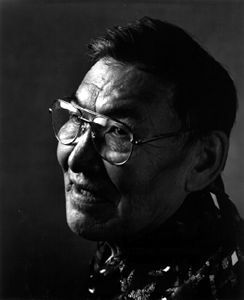 John Tiktak, sculptor (b at Kareak, a small camp between Eskimo Point (now Arviat) and Whale Cove, NWT 1916; d at Rankin Inlet, NWT 9 June 1981). At first a hunter, he moved to Rankin Inlet in 1958 to work at the nickel mine. The mine closed in 1962, and he took up carving "professionally" in 1963, having previously carved "small sculptures representing Eskimo faces" that he sold as souvenirs. His work, dating back to 1961, is in every museum and major private collection of INUIT ART. His personal style, with its rounded shapes and hollows, has definite affinity with Henry Moore, who admired Tiktak's work greatly. Like Moore, he was an icon maker, producing form and symbols rather than subject matter. In 1970 he had a retrospective exhibition at the U of Manitoba. He was elected to the Royal Canadian Academy of Arts in 1973.